Stronger than anticipated hiring in April, together with sizable upward revisions to the February and March employment figures, have alleviated concerns that sequestration will severely impair the employment market. Although some sectors such as manufacturing and construction have lost a bit of momentum, job creation continues to make headway and intial unemployment claims have fallen to a five-year low, signaling that the job market will make steady, though unremarkable, progress. Still, headwinds such as increased payroll taxes, sequestration and Washington’s ongoing intransigence on fiscal matters will continue to pressure economic growth, weakening the overall employment outlook. Private-sector employers added 176,000 positions in April, but this figure was offset by government reductions of 11,000 jobs. Significant revisions to the February and March numbers boosted the year-to-date hiring total to 783,000 jobs, on par with the performance in both 2011 and 2012. The professional and business services and education and health services sectors led the gains last month, but relatively strong consumer spending so far this year helped support the hiring of 29,300 retail workers last month. Further evidence of the vigor of the nation’s hotel sector was evident in the hiring of 45,100 workers in accommodations and food services. Three private-employment sectors shed jobs in April, including construction, where reduced government funding for projects contributed to a loss of 6,000 jobs. Roughly 60 percent of the private-sector positions created last month were either temporary or in the retail or leisure and hospitality sectors. Temporary positions pay lower wages and include fewer work hours than full-time jobs, while retail and leisure and hospitality positions tend to pay less than other sectors. The increased incidence of these lower pay scale positions will sustain demand for rental housing and necessity-oriented retailers, such as those found in strip centers and neighborhood centers. With the addition of 42,200 jobs last month, full-time office-using employment is now less than 2 percent off of its peak level recorded at the start of the recession. Nationwide office vacancy was 16.7 percent at the end of last year, nearly 400 basis points higher than at the start of the recession. Gains in full-time office-using employment have translated into absorption of under-utilized space and limited expansions into larger layouts. As newly hired workers continue to fill empty cubicles and desks during 2013, new space requirements will emerge, supporting an 80-basis point decline in vacancy to 15.9 percent. Job growth continues to spark the creation of new rental households and support a vigorous apartment sector nationwide. First quarter vacancy was unchanged at 5.1 percent, but has declined 200 basis points since the economy started to add jobs again in early 2010. Demand growth will outpace an increase in completions this year, reducing the nationwide vacancy rate to the high-5 percent range. 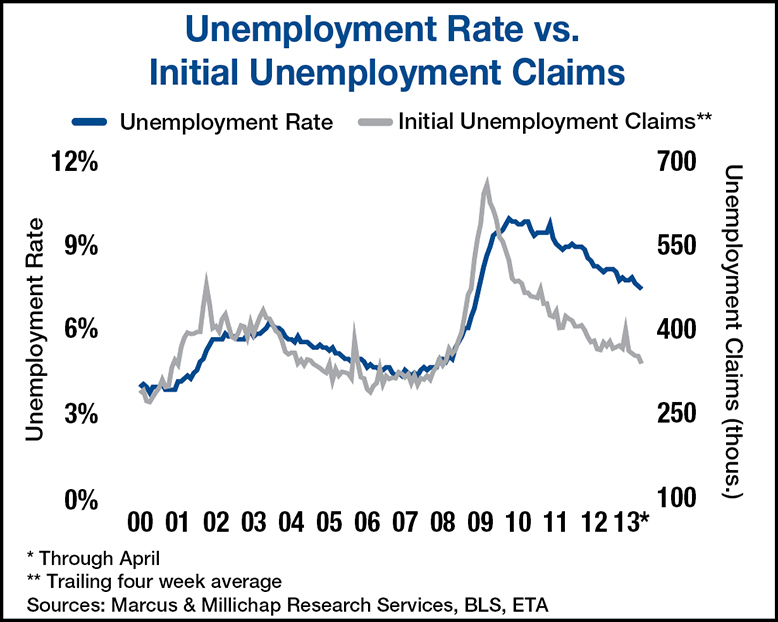 This entry was written by marcusmillichap, posted on May 6, 2013 at 4:37 pm, filed under Research and tagged Commercial Real Estate, employment may 2013, unemployment, unemployment rate vs initial unemployment claims. Bookmark the permalink. Follow any comments here with the RSS feed for this post. Trackbacks are closed, but you can post a comment. Buy and hold property for 5-7 years or when 35% in appreciation has been achieved.